When I first discovered Yogamatters I was like a kid in a candy shop! Back then, and even now to some degree, yoga product were very hard find. With Yogamatters you will find something for all your yoga needs, on and off the mat, all under one virtual roof. They don’t stop at mats, props and clothes. They stock everything you could possibly think of that goes with being a happy yogi – from meditation accessories, candles, creams, soaps and even teas. They also have a vast collection of yoga books to help you progress along your journey – covering subjects from yoga styles, anatomy and philosophy, to meditation, healthy eating, journals and 108 Asana yoga sequencing cards! Their knowledge and genuine love of what they do is obvious by the care they take to source suitable products. Each chosen for their quality and unique contribution to their customers yoga experience. As a company they have a strong focus on working with suppliers with strong ethical credentials and sustainability. Yogamatters make finding your way onto your mat each day easy and pleasurable. Go to their website to browse and shop there extensive 2,500 products. You can also follow them on Instagram to keep keep an eye out for new products and sign up for their newsletter to catch all blog articles, highlighted products and seasonal themes. Complete yogi bliss! Fearne Cotton is no stranger to us! I only recently stumbled across her podcast and I’m absolutely loving it. Built on the success of her bestseller book ‘Happy’ Fearne interviews a wide variety of guests to delve into what happiness means to them and what we can learn from others to ‘help you unlock your inner happiness’. Through her guests we also find comfort in shared experiences – good and bad. She is an absolute pleasure to listen to with her guests and always put a spring in my step while I’m out on my Podcast binge morning walks. The Happy Place Podcast is available on iTunes, Podbean and Acast. Pukka has been one of my kitchen staples for many years. Inspired by the ancient Indian wisdom of Ayurveda they help us to simply incorporate these principles into our everyday lives – all this while we happily sip on a delicious cup of Pukka tea! Their mission is to ‘harness the incredible power of nature’ by sharing their passion for the wonders of the health and wellbeing properties of herbs. Each herb has its own unique story and this is as important to them as the end products. They source from the very best growers who have a deep understanding of the journey of the herbs, from seed, to soil, to plant. Sustainability is top of their agenda and through their ‘crop to cup’ data they strive to continue to reduce their carbon footprint. Over the years I’ve probably tried every Pukka tea and a wide range of their herbal supplement and have loved them all. My favourite teas are Cleanse for an extra glow; Relax in the face of after school mayhem; and Revitalise to replenish my stores after a class. Recently I’m enjoying popping one of their teabags into our morning porridge, as it putter away on the hob, while I settle on my mat for my early morning practice. I’ve used their Wholistic Turmeric to boost my immune system; the Aloe Vera Juice for gut health; the Elderberry Syrup at the first sign of a spluttery kiddie cough; the Triphala to support me while doing a cleanse; and their Wholistic Ashwagandha when I’m feeling a bit frazzled by life. I’ve also become completely addicted, in a good way, to their new latte range. My favourite being the Ginger Joy. As a non caffeine drinker it’s my morning treat with steaming frothy oat milk. Lucky for us Pukka Herbs are widely available, you’ll find them in The Hopsack, The Health Store, Nourish, all good health shops and most supermarkets too. You can also shop their full range of teas, supplements and lattes, direct from from their website. Like every good wellness brand they have a wealth of knowledge that they impart to us through their blog articles, well worth a browse. WellFest is Ireland’s largest yearly health and wellness festival, running on 11-12th of May ‘19. Which coordinates perfectly with the sun gathering momentum for the Summertime and energy levels on the rise. The festival hosts over 150 national and international health and wellness experts. The line up is always incredibly impressive and the choice is unparalleled. No matter what your prefered interpretation of what wellness means to you they’ve got you covered – from Main stage presenters to WellFit, WellFood, Wellmind, WellYoga, to name but a few. If like me yoga is your passion this festival is a must – with back to back classes all weekend with Ireland’s top yogis and visiting internationally acclaimed yogis. There is no limit and no extra charge to any of the activities and talks all weekend. Top tips from a seasoned WellFest goer – print out the line up and mark up your schedule for the two days. The only complaint you might have is there was so much you wanted to do you could have done it all again! As one of the WellFest award winning online publications writers I have the absolute pleasure of teaching at the festival again this year. You’ll catch me at the WellYoga stage. Check out the detailed schedule closer to the day to find my slot and come say hello. Tickets sell fast for this one, go to their website to avoid disappointment! A weekend ticket is €79 and a single day ticket for €49. Sign up for the Wellfest Blog to get some inspirational articles on all things wellness straight to your inbox, or follow them on Instagram to stay up to date on the festival lineup and ticket sales. Adding to their amazing accomplishments, Deliciously Ella has stepped into the world of Podcasting to share their wealth of knowledge, and experience, in all things food and health related. Deliciously Ella is the brainchild of Ella and Matt Mills – husband and wife team. Ella started a food blog in 2012 to journal her path to wellness from an autoimmune disease through eating good whole foods. The growing realisation that the key to good health is in nature brought her on an incredible journey to where she is today with a team working under the name originally started as this humble food blog ‘Deliciously Ella’. They have written four plant based cookbooks, built recipe aps, opened London based delis, launched a variety of widely available food product ranges, and now a Podcast! The podcast eloquently tackle some tricky subjects – like climate change, veganism and diet myths – in an easy to access conversations. One of my favourite episodes is ‘Why we care’ where they very honestly discuss why they do what they do, and what drives their passion to share their plant based journey. The weekly podcast also hosts guests from the world of health, nutrition and business to share their expert wisdom and offer a wider perspective to their listeners. Their passion and honesty is completely contagious. Everything they turn their hand to rings true to their core message to eat real food and share the joys and benefits of plant based living for each individual and the planet we all live in. The Delicioulsy Ella Podcast is available on iTunes, Podbean and Acast. This is an Organic vegan superfood brand I have watch grow since 2011, from three pals passionate to share their journey and all they’d learnt about positive health, to a widely available growing range of over 60 products. Originally Ireland’s Raw Kitchen they did what every good entrepreneur does – absolutely everything themselves! – from filling bags to fulfilling orders. In 2014 they redesigned their branding, changed their name and Nua Naturals was born! The range spans pretty much every superfood I’ve come across, with the addition of berries, seeds, lattes, smoothie boosters and vegan friendly protein powders. Their philosophy is to help their customer ‘make small changes that make big differences to their lasting health for a happy and balanced life’. They also have recipe and a blog on their website which is well worth a browse for tips of how to get the most out of the products and articles on a range of topics such as immune system support, best superfood to add to your diet and skin health. Nua Naturals are available in The Hopsack, The Health Store and all good health shops. You can also order direct from their full range of products, browse their recipes and read their healthy tips for life blog from their website. As a designer I am naturally drawn to aesthetically pleasing objects in all facets of my life. I have an appreciation of the time that goes into creating a beautiful object, and when it is functional too I get very excited! Arran Street handmade homeware is both. They refer to themselves as ‘architects in clay’ which is a genius explanation of their style of crafting. Their designs are an admirable balance between simplicity and rustic with a nod to Irish heritage. They are hand-thrown which makes each piece unique in it’s own little way, and yet still has uniformity that clean lines and simple structure require. Each piece is stamped with a signature ‘A’, inspired by the old-Irish A on the Arran Street East street sign. The palette of earthy colours is inspired by the ,location of the studio, tucked away beside Dublin’s Victorian Fruit and Vegetable Market. Soft hues of fruit and vegetables like pink grapefruit, lemon, pomegranate, cabbage, potato, and parsnip. The care and craftsmanship of each piece is obvious to the touch. They are an incredibly tactile objects with a lovely hearty weight. You can feel the story in every textural line. You can visit their studio and shop on Little Green Street, grab a coffee in their little coffee shop, and see where the magic happens. They also run workshops to share their knowledge and teach you the craft of throwing. When at home I drink from only one cup and eat from one plate, or one bowl. It adds to the mindful experience of being present while eating – savouring the taste and enjoying the company at mealtimes. Even if I’m the only one who has my own special handmade delph! Arran Street is available from a growing retail list of stockist and online stockists. They also have an online shop where you can buy direct from the studio. Headspace is probably the best known meditation App with the largest library of guided meditations to support you through every eventuality in life. There are thousands of studies that have shown mindfulness meditation can positively impact mental and physical health. Headspace is committed to researching the science behind this ancient practice to understand its far reaching benefits. I had been meditating for a while before I started using Headspace, but felt I needed a bit of extra guidance and wanted to learn a bit more about different meditation techniques, like noting and visualisation. It is fast becoming the most daily used App on my iPhone. I meditate every morning with Headspace, picking either an individual guided meditation or a themed course. Along with the daily meditations I use it to support specific need like ‘Presentations’ before a meeting or ‘Transforming Anger’ if I’ve blow a fuse with the kiddies and need some ‘headspace’. I’ve even used the ‘Losing your Temper’ meditation on the kids – getting them to sit quietly, listen to the meditation and take a minute after for contemplation. It’s a fantastic parenting tool! Meditation may not change life events but it does help change your reaction to life events. It helps you stay present and not get caught up in the ‘what ifs’ wheel. The benefits of the practice are far greater than the value of the small amount of time required for your daily practice. Headspace are currently running a 40% off for a whole year of meditation. Simply go to their website and subscribe. I started with this deal last January and loved it so much I’ve just resubscribed for another year. You can also sign up for a free trial which gives you a few sample meditations. There is a full schedule of classes to choose from, including Slow Flow, Yin, Yoga Fundamentals, Prenatal and weekend workshops. You’ll find me there every Thursday morning for my 9:15am class. Booking in advance is recommended. To find out more about Moons Yoga Loft and to book classes check out the website. Classes can be booked direct online from MINDBODY or on your mobile by downloading the Mindbody App from the App store. What do you drink when you’re not drinking? Inspired by The Art of Distilling published in 1651, Ben Branson has invented the world’s first distilled non-alcoholic spirit. It has been a long time coming and on behalf of all non drinker thank you Seedlip! But this isn’t just hitting the spot with non drinker, it is sweeping through top-rated restaurants, the world’s best cocktail bars and luxury hotels with the most incredible success story, selling out in Selfridges in less than half an hour! 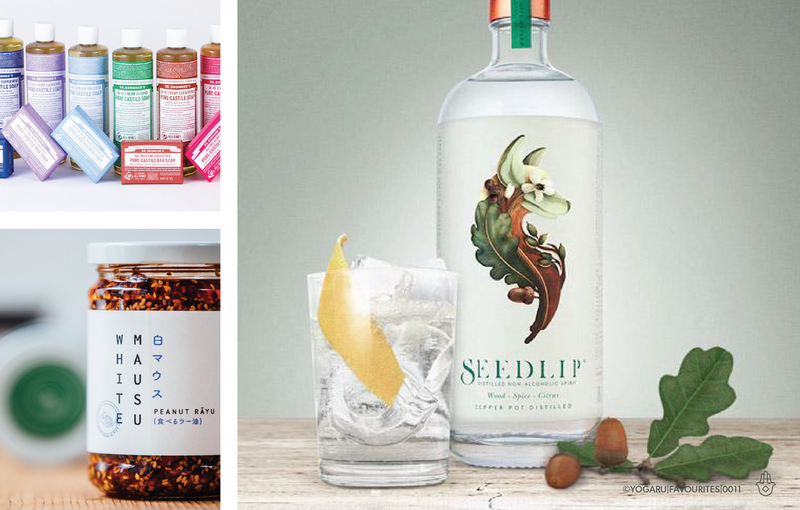 Seedlip is on a mission to change the way the world drinks with the highest quality non-alcoholic options. It initially caught my attention with it’s striking packaging. The illustrations are stunning and the logo tips its hat to the historical craft of distilling. Their website is worth a visit too – simple to navigate it tells the story of Ben’s journey, gives information about the ingredients, lots of ideas for non-alcoholic cocktails and a list of stockists. I first tried the Garden 108, drawn to it for its kindred spirit in the sacred 108, served simply with tonic water and a pea shoot at The Ivy. It was incredibly refreshing and was a revelation to finally being able to join in with the gang and get in the festive spirit without the spirits! As a complete spice addict I’ve treated myself to a bottle of Spice 94 and intend to experiment with lots of Instagramable mocktail over the Christmas period! Seedlip is available in select off licences and as a special treat for a post shopping cocktail in The Ivy Dublin! You can also order direct from their website and see the full range of their products. I am totally obsessed with Dr Bronners liquid soaps. Only the purest organic and fair trade ingredients go into their products. They are mainly vegan and certified to the same organic standards as food, with no synthetic preservatives and no foaming agents. Dr. Bronner’s was founded in 1948 by Emanuel Bronner, a third- generation master soapmaker from a German-Jewish soapmaking family. They are still a family run company with an ethos for working hard on sustainability and reducing their carbon footprint which is definitely an area I will be focusing on for 2019. My current favourite is the Lavender Liquid Soap. Unlike some other soaps it is scented with pure lavender and lavandin oils that are very calming and soothing to the mind and body. It is concentrated so a little goes a long way. I got one of their 32oz bottle and it lasted for months of family showers and multiple other uses. They are called 18-in-1 Pure-Castile Soaps for very good reasons. They are up for just about any cleaning task with the added bonus of leaving a lovely scent. Along with showering I use the lavender liquid soap to clean my yoga mat, add it to a bath with epsom salts for a long soak, or for a foot soak after a long run or a busy day. Dr Bronner is available in The Hopsack, The Health Store and some select health shops. You read more about their story and see the full range of their products from their website. This little condiment if fast becoming a cult product and I’m giddy at the thought of our girl Katie Sanderson expanding the range! It makes the foods on your plate all dance together and your taste buds sing with glee! A little drizzle over any Buddha bowl combination, or even our Saturday weekly beanie hotpot, is heaven on a plate. It works with just about anything, I’ve even been known to sneak it on to my savoury porridge! It’s in hot competition with our other family staple hummus which as a plantie based house we go through by the lorry load. Katie spent her early years in Hong Kong and has used this to influence her creativity and her incredible palette for flavour. I’ve had the pleasure of sampling her menus at a yoga immersion in Fumbally Stables and it was elegantly breathtaking and like nothing I’ve ever tasted before (or since!). White Mausu Peanut Rayu is available in The Hopsack, Fallon & Byrne, Avoca, & Brother Hubbards to name but a few! You can also find a full extensive and growing list of stockist from their website and see the full range of their products. This months favourite finds is very topical, covers many of my growing interests in environmental issues, and has the added seasonal bonus of giving plenty of Christmas stocking ideas too. I recently encountered a gem of a little shop called The Sustainable Store in the heart of Blackrock Market, Dublin. Its mission is to ‘bring plastic free and chemical free products to the local folk’, and with the immanent launch of their website, to the national folks too. It’s a little space that packs a punch for a sustainable future. One of those ‘I’ll have one of everything please’ shops! Each product is carefully researched and has to pass a rigorous test for environmental and ethical manufacturing before it qualifies to become a member of the family. They have done all the research for you to make it that bit easier for you to make a difference this Christmas. Eliminating the plastic water bottle is the perfect place to start for anyone who is trying to reduce their single use plastics, and the Jerry Bottle is a classic. Cutting out plastic water bottles from you life and refilling your Jerry Bottle can be one of your New Year’s resolutions! 100% of Jerry Bottle profits go to supplying clean water projects in Tanzania and India with the Waterfall Charity and other organizations striving to provide clean water to those without. Jerry Bottle is passionate about the importance of water. Without it there is no life on Earth. As we become more health conscious we’re more inclined to bring wholesome home prepared lunches into school and work, unaware that we are undoing some of our good intentions by storing the food in plastic lunch boxes. Plastic is not only bad for the environment, storing food in plastic boxes leeks toxins into the food, particularly hot food. Stainless steel is clean, safe, durable and made to last. These A Slice of Green stainless steel lunch boxes come in lots of different shapes and sizes. Many of the lunch boxes are leak resistant which is definitely a perk when it comes to school lunch boxes. One of my favourite items is the Bambu spork - for the combination of it’s handy inventiveness and the word ‘spork’! A complete must have and a fantastic stocking filler for anyone who eats food. Incase it’s not obvious it’s a spoon and a fork rolled into one compact little item. Made of bamboo it comes in a cork sleeve making it pocket ready for your weekend market brunching and munching, so you can proudly announce to the vendor that you won’t be needing plastic single use cutlery. Bamboo is the fastest growing species of grass, it can grow a meter a day and doesn’t need to be replanted after harvesting because of its sturdy root system, it requires no fertilizers or pesticides and it guzzles up carbon dioxide. So many reasons to start a spork revolution! Plastic toothbrushes are in the limelight at the moment for their incredible ability to end up on our beaches and in our seas! Each toothbrush takes up to a thousand years to decompose and 3.6 billion plastic toothbrushes are used worldwide every year. Georganics eco-friendly toothbrush is made from 100% biodegradable bamboo with soft and effective charcoal infused bristles. Georganics toothpastes are completely natural and fluoride free formula, made with vegan and organic ingredients. Their packaging is designed to be plastic free, biodegradable and recyclable. They also have a range of oil pulling mouthwashes – following the ancient ayurvedic practice of oil pulling. It is said to reduce harmful bacteria in the mouth and offers a natural alternative to conventional mouthwash. These oils combine coconut oil, which is known for its antimicrobial properties, and other essential oils, to boost its properties and add a fresh after taste. We generate a huge amount of waste over the Christmas period with our binmen adding extra lifts to keep up with all the extra packaging. This Christmas add a theme of sustainability to your gift giving to counteract the extra load. New good habits are easier to make at the start of a new year. Your new habits can make a big difference for the future. All of these products, and many more, can be found in The Sustainable Store, Blackrock Market, Dublin. The best way to keep in touch with them is to follow them on Instagram to keep upto date on new products and the launch of their website in December.